More than 10,000 people over the age of 50 volunteer with us across the UK, in many different ways. We develop, support and run brilliant volunteering projects for and with people over the age of 50. Like Grandmentors which matches 50+ year olds as mentors for young care leavers, or Sporting Chance, which gets male volunteers out and active, and Help at Hand, which matches volunteer befrienders to some of the most isolated individuals in the community. We also support many people to start and lead their own projects through the Retired and Senior Volunteer Programme (RSVP). 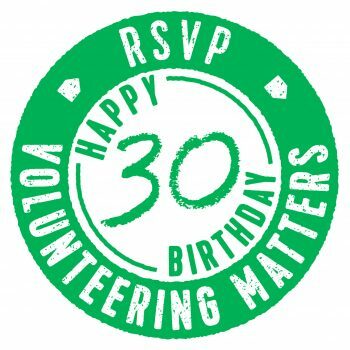 Celebrating its 30th birthday this year, RSVP responds to local community needs, enabling people aged over 50 to take a lead role in both setting up and participating in volunteering activities that improve the health and wellbeing of others in their community – running sports clubs, employability skills workshops, patient driving schemes, knitting groups and much more. We currently have more than 240 volunteer-led RSVP groups running across the country, and are always keen to help people start their own in response to local community needs. Nearly 500 of our RSVP volunteers are Volunteer Organisers (VOs), acting as team leaders to the RSVP volunteers in their areas, responsible for managing a team of up to 40 volunteers. Please get in touch if you’re interested in starting your own RSVP programme. Take a look at all our projects, programmes, and RSVP coordinated activities below. Heather’s Hair is an RSVP project that creates hairpieces and weaves for people experiencing hair loss due to chemotherapy or other reasons. Lifelines project in Brighton brings together people aged 50+ both as volunteers running activities and as participants in the wide range of volunteer-run activities. Norfolk Knitters and Stitchers provide support to charities at home and abroad with hand knitted items as well as creating a community & friendship for isolated individuals. Grandmentors is an innovative project that sees older volunteers use their lifetime of skills and experience to support vulnerable young people leaving the care system. This opportunity is for Grandmentors Warwickshire. Grandmentors is an innovative project that sees older volunteers use their lifetime of skills and experience to support vulnerable young people leaving the care system. This opportunity is for Grandmentors Stockton. Learn Together Scotland is looking for volunteers aged 50 and over to support on literacy skills building in their local community. RSVP knitting groups provide an opportunity for older people to be social and is also a opportunity for older people to still feel useful in retirement and give back to their community. Grandmentors is an innovative project that sees older volunteers use their lifetime of skills and experience to support vulnerable young people leaving the care system. This opportunity is for Grandmentors Folkestone. Volunteering Matters is working in collaboration with other experienced organisations to provide help for isolated people and carers living in the Newport area - specifically in this role supporting carers with their travel needs. Newport Support Partnership is working with local partners to provide help for isolated people and carers living in the Newport area - specifically in this role, help around the home. Volunteering Matters is working in collaboration with other experienced organisations to provide help for isolated people and carers living in the Newport area - specifically in this role, befriending isolated carers. RSVP volunteers are all aged over 50 and draw upon on their experiences to lead and develop projects targeting needs in their local community. We have 10,000 volunteers, of which over 450 are Organisers. RSVP currently have volunteers in more 350 schools around the UK. Our aim is to help more older volunteers take part in this popular programme. Grandmentors is an innovative project that sees older volunteers use their lifetime of skills and experience to support vulnerable young people leaving the care system. This opportunity is for Grandmentors Islington. Grandmentors is an innovative project that sees older volunteers use their lifetime of skills and experience to support vulnerable young people leaving the care system. This opportunity is for Grandmentors Hounslow. Twigs Garden Club is all about providing a ‘laid back gardening for all’ approach to gardening. Looking for people aged 50 and over based in Brighton who want to stay active and involved in their local community. We will support you to run or take part in a huge range of activities - from computer clubs to loss support groups. Over the past few months the One Small Step Project has had no shortage of updates, and we thought there would be no better time to share them with you than to round up 2017! Sandy, 70, from Stirling has been volunteering with our Handyperson Project for the past 10 years and he told us what a day in his volunteer role looks like. As part of our Older People Focus week, Nora told us about her experience of being part of HealthLink, which supports older people to get to their healthcare appointments. Mary just celebrated her 90th Birthday with the volunteers at Welcome Friends in Wales. Our Senior Development Coordinator in Cardiff told us about it! "I really enjoy my visits just as much as Shirley does. I know that I am helping Shirley and feel privileged to be able to do so." "Paula and Pam showed us the light at the end of the tunnel." " Ena knows that I will look after her, take her home at the end of the day and make sure she is safe." "Mentoring gives us an opportunity to continue to deploy our skills and knowledge, but in a very different environment." "I love volunteering - it boosts my mood and helps me feel I am doing something worthwhile with my free time. For me, volunteering was a lifeline." "My befriender, Anne, is worth her weight in gold." "Volunteering is a great help in deterring feeling lonely or bored." "Two hours of my time each week doesn’t seem much, but for me it means that on two days there is a purpose to my day – a reason to get up, shower, change and get ‘out there’." Jan has written a poem about how her Nan inspired her to knit, and why she has continued to knit throughout her life. "I have found volunteering to be an excellent way of giving something back to people and helping to make their lives a little easier." "Chris has always encouraged me and I feel really supported by his Prime Time project." "Volunteering Matters to me because it has helped me see the light at the end of a dark tunnel." "Feeling like a part of the community is so important after retirement." "Volunteering Matters to me because of the impact it can have on our community and how it makes such a difference to peoples’ lives." "It’s not just the contact, it is the fact that they are thinking of me which is very special to me"
"My time with Kay has given me some valuable insights into what life is like for many elderly people in the UK." "Loneliness is something that can affect anyone at any time, and it is projects like this that are so important in helping to stop it." "Sporting Chance, its wonderful instructors and the other men have given me my life back." "I've met all sorts of people. It's great to share all our stories and experience the pleasure in volunteering"
"I had never lived alone before my wife passed away. Living alone was a big shock initially, but volunteering has helped my well-being a lot." "I really like the fact that I can hopefully pass on my own knowledge and experience to help the next generation." Our Retired and Senior Volunteering Programme (RSVP) in Coventry has been delivering a project tackling isolation and improving wellbeing amongst older people in Coventry through volunteer-led activity. Retirement is an opportunity for you to use and develop your skills and talents further than you thought possible. Read how volunteering in retirement is becoming more prevalent. Funds from the players of the People's Postcode Lottery will continue to help Volunteering Matters tackle social isolation and loneliness in the UK. KBNe UK, a partner of Korean Broadcasting Network in Europe, are producing a TV documentary about life and opportunities for senior citizens and the importance of the third sector, and sought to highlight our work in the UK. Our RSVP conference provided the perfect backdrop for the production team to meet some of our amazing volunteers. Margaret is a retired secondary school Head of Art, and has has been teaching an art class as part of LifeLines for local people over 50 for almost 5 years. She shared some of the work and explained the theme of the most recent project! Green fingered staff members from the People’s Postcode Lottery picked up their shovels to transform the garden at a local hospice in Edinburgh recently as part of their employee volunteering programme. Volunteering Matters is one of 13 organisations selected by the innovation charity Nesta to take part in the Second Half Fund, enabling us to replicate our Grandmentors project in five new areas. Sheffield over 50s were joined by special guests including Anne Murphy, the Lord Mayor of Sheffield at Longley Four Greens Community Centre this week to celebrate the launch of Sporting Chance. Volunteering Matters, with support from strategic funding partners, is commissioning an external review of their Grandmentors programme. Middlesbrough’s Sporting Chance group star in a film that forms part of a national campaign to expose the growing crisis of loneliness and encourage people to take action to overcome the problem as part of the Jo Cox Commission on Loneliness. We, as part of a consortium, have been awarded £975,370 from The Big Lottery fund to develop the Rural Wisdom project to run for 5 years. We have been awarded £600,000 in funding from players of the People’s Postcode Lottery to support our work in tackling social isolation and boosting the health and wellbeing of older people across the UK. Our Women Against Sexual violence and exploitation Speak UP (WASSUP) project, based in Ipswich, has won the Anne Dunford OBE Award for youth participation. Our Help at Hand befriending project won an ‘outstanding achievement in health and wellbeing’ award at the Stirling Volunteer Awards last night at the Albert Halls. The Volunteer Friendly Award (VFA) is a fantastic way of showing that your group is good at involving and appreciating volunteers. Could our innovative intergenerational mentoring programme for care leavers become a new national norm? Our Head of National Programmes Gethyn Williams and Will Bibby, Programme Manager at Nesta gave their take.